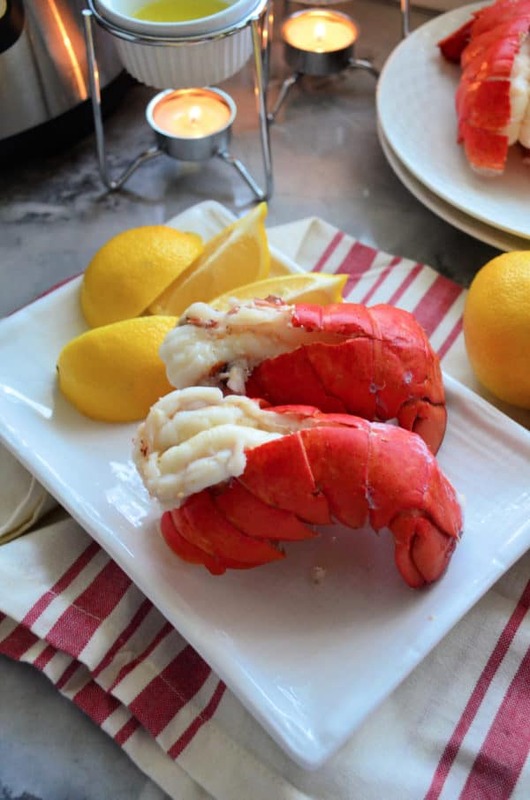 Cooking lobster tails can be scary, and with my no-fail recipe for Instant Pot Lobster Tails you’ll never be scared to cook them again! Valentine’s Day is right around the corner. Do you typically stay in and cook? Or go out– battle the crowds and pay for overpriced food? Since having kids we have opted to stay in. We have found that we not only save a lot of money, we aren’t battling crowds, and we have just as good if not better of a Valentine’s Day dinner in the comforts of our own home! Plus we get to spend the holiday with our children and share the love with them. My kids are already quite the “foodie’s”. They have extremely refined pallets for such young ages! My almost 2-year-old absolutely loves lobster! In fact, when I was testing this recipe multiple times she ate an entire lobster tail all by herself! She would rather have lobster over steak. I mean I can’t blame her. I love lobster too. If you’ve ever been intimidated to cook lobster this is the recipe for you. This is the most fool proof way to cook lobster tail all thanks to the all mighty Instant Pot. Is it better to steam or boil lobster? Technically, steaming is the better method of cooking a lobster tail. I only started steaming my lobster tails this year and I will say it is definitely the most forgiving method (and honestly, the easiest)! It’s definitely a little harder to over cook a steamed lobster. Especially since you are using the Instant Pot that has it timed perfectly. Even if you forget to do a quick pressure release and leave them in for a few minutes you should be fine! Do you cut the lobster tail before you steam it? Yes! I like to cut them prior to steaming to ensure that the meat has room to expand and cook and ultimately the meat keeps its shape. I’ve yet to fully master the cutting part. To cut the shells: Place the tip of kitchen shears into the middle of the hard rounded side of each lobster shell. Then, cut down all the way to the tail fan (be careful not to cut the meat or your hand). Place your hands on each side of shell and push down until tail pops about halfway out of shell. Rinse each tail under cold water to remove any grit or shell fragments. Repeat until all the lobster tails have been cut. How do you cook lobster tails in the Instant Pot? First, you will want to rinse the lobster tails off using cold water. Then, cut the tails to expose the meat. Follow the steps above on how to cut your lobster tails! Once your tails are cut place them in the Instant Pot on top of the trivet. Make sure to not overcrowd the Instant Pot! You do not want to stack them on top of one another. Instead, place them side-by-side. If you have a steamer basket for the Instant Pot you could use this as well. You just don’t want the lobster tails sitting on the bottom of the Instant Pot. Make sure to fill the Instant Pot with at least one cup of water. 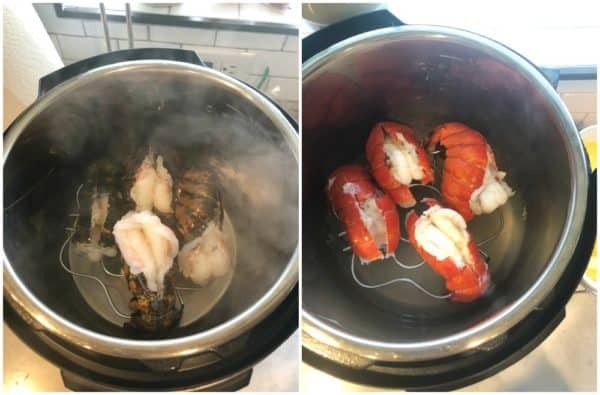 You want to make sure that there’s enough water to create steam; however, you don’t want the lobster tails boiling in the water that is sitting inside the Instant Pot. I’ve tested this recipe multiple ways. I have placed garlic and herbs in the water. I’ve also just steamed the lobster tail with just water. I’ll be honest, I did not taste much of a difference. If you want to go fancy add a few cloves of garlic (5-7) and fresh herbs like thyme and rosemary into the water. But if you don’t have any of that on hand don’t worry! Your lobster tails will still steam perfectly. Next, close the lid, placing the steam valve in the locking position. Set your Instant Pot on “steam” mode for 2 minutes. If your lobster tails are frozen you can set it to 4 minutes (3-minutes if partially thawed). As soon as the lobster tails are done cooking. Carefully, force pressure out of the Instant Pot. This will take about one minute. Once all of this steam has released you can carefully unlock the lid. As soon as you remove the lid you’ll see perfectly cooked lobster tails. 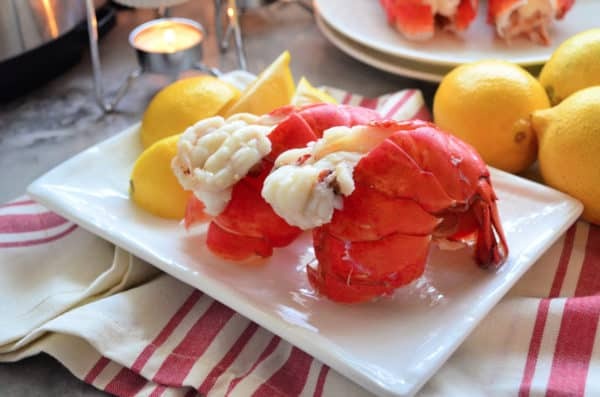 You can brush on a little melted butter onto each piece of lobster and then serve immediately. I like to serve our lobster with lemon wedges and melted butter. Everyone else loves the melted butter I just prefer lemon to keep the calories down. How do you cook frozen lobster tails in Instant Pot? I have tested both fresh and frozen lobster tails. You can cook frozen lobster tails in an Instant Pot; however, I will be honest that I wasn’t a fan of the texture. At least that’s how I felt. My husband thought they were absolutely fine as did my mother in-law and father in-law. You can cook frozen lobster tails for 4 minutes on “steam” or partially thawed lobster tails for 3 minutes on “steam” setting. Also, if your tails are partially thawed you can still cut the tails to release the meat; however, they are going to look like the above picture (not that pretty). If you cook from frozen you will not be able to cut the shell. So keep that in mind. You’ll have to do it after the lobster has cooked which will make it hot and hard to cut and handle. 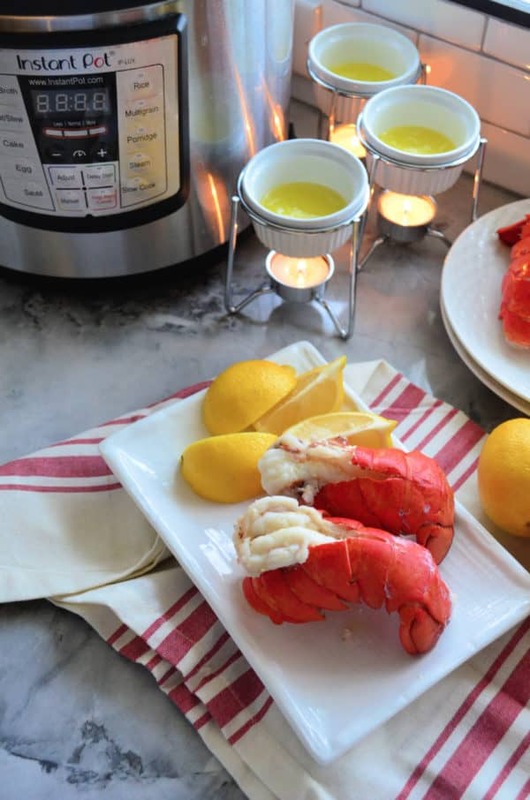 What size Instant Pot do you need to cook lobster tails? I have a 6-quart Instant Pot and I can fit 4 tails in comfortably. Maybe 6 if I used a steamer basket (I just got one–so I’ll try it out and see if I can fit more). I would imagine if you have an 8-quart Instant Pot you could cook 6-8 easily because it’s a larger Instant Pot–but I’m only speculating here. 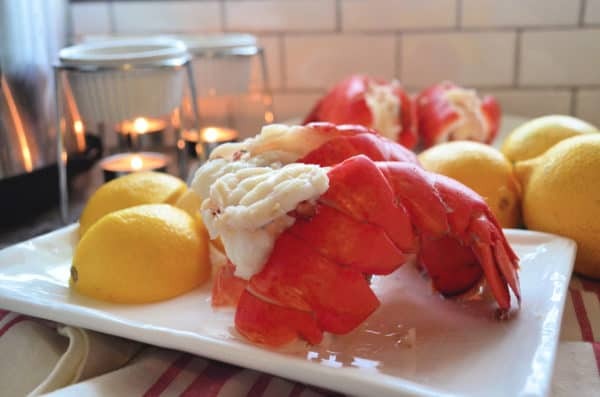 If your looking to wow your Valentine–or maybe you are looking for a quick fancy dinner (thanks to a sale on lobster tails). 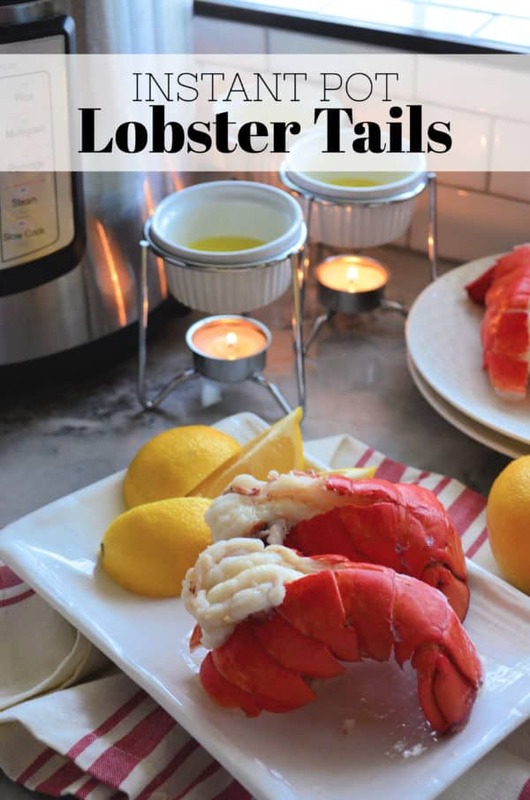 Then this recipe for Instant Pot Lobster Tails is the recipes for you! Looking for other recipes to go with your lobster tails? Cut the lobster tails on the rounded side down to the fan of the tail. Carefully, pop meat out of the tail. Rinse under cold water to remove any grit or shell. Repeat until all the lobster tails have been cut. Using a steamer basket or trivet place in the Instant Pot. Place the tails on top, then pour in 1 cup of water. Close lid and place steam valve to "sealed". Cook on "steam" for 2 minutes. *See notes on cooking frozen below. It will take 2-3 minutes to come to pressure then 2 minutes to cook. Once the tails are done cooking and the timer beeps, carefully force pressure from the valve *this will take about 1 minutes. Carefully, unlock the lid and remove the lobster tails. Brush each piece of meat with a little bit of melted butter. Serve with lemon wedges and melted butter. Enjoy immediately. *Cook semi-thawed lobster tail on "steam" setting for 3 minutes or frozen for 4 minutes.